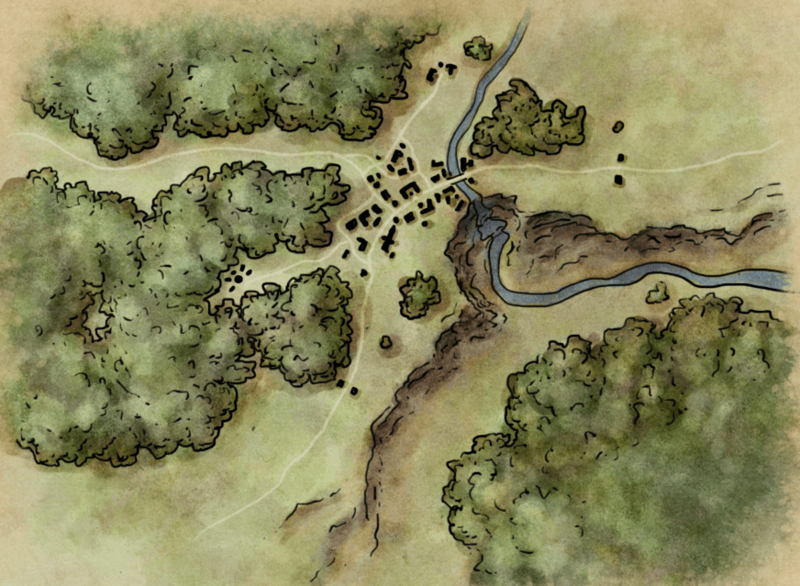 This tutorial covers my entire process for how to draw a map – from start to finish. In this case I’m illustrating a simple town map, but the steps apply to any map. I used Photoshop for this map, but all of this can be done in Gimp (for free). I also use a graphics tablet. 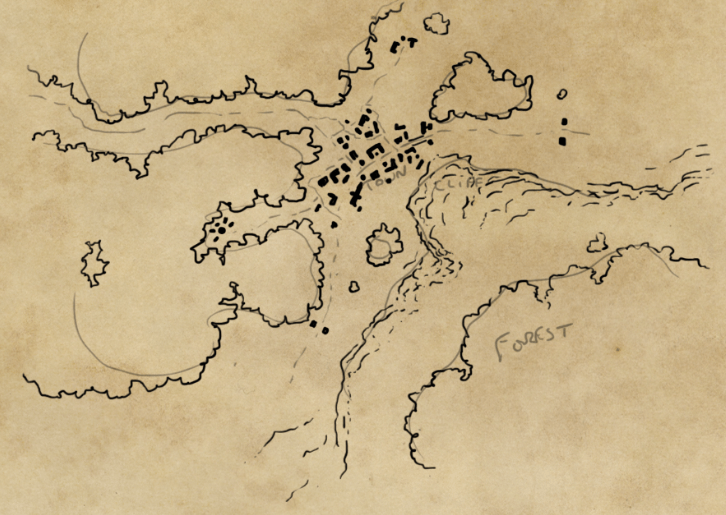 Tablets are great for this work, and if you’re thinking about digital map making I’d recommend picking one up. I use a Wacom Intuous, but I started on a Wacom Bamboo (much cheaper and almost all the same functionality). You can also follow along using pen and paper, a scanner and a mouse. I’ve uploaded the full photoshop file if you want to look at the final file and see how the sausage was made. The full size final map is here. Feel free to use it for personal use. I’ll go through each of these steps in order. To begin, let’s open a new document. Here I’ve started with a small document as this is purely digital. It’s 1200 pixels by 900 pixels (I trimmed it down at the end). That’s large enough to fill most computer screens. If this was for print, I’d create a document 3600 by 2700 pixels. This is because print requires a resolution of 300dpi, and screens tend to be closer to 100dpi. So for print, you need to up the resolution by 3x. I grabbed one of my parchment textures and set it as the background. This is one I built myself, but there are a bunch of old paper textures out there to use. CGTextures has a ton of old paper textures. So far, so unexciting, but this is a solid base to start from. The first step in any map is to create a sketch. This is when the core design work is done. This step can take days, or can be a quick process of laying down an idea you already have fully formed. Here I want to lay out a town, some forest, and a cliff. Designing a town can be a complicated process – I wrote up a full tutorial on how to design a town map so I won’t go into that process here. For the sketch, create a new layer and use a hard round brush. I use a 5px round brush with the size set to pressure-sensitive. I quickly block in the large outlines of the forest, a line for the cliff, and the roads to define the town. At this stage – you want to see whether the map makes sense. Does it fit the page? Are you cramping the detail in some regions? 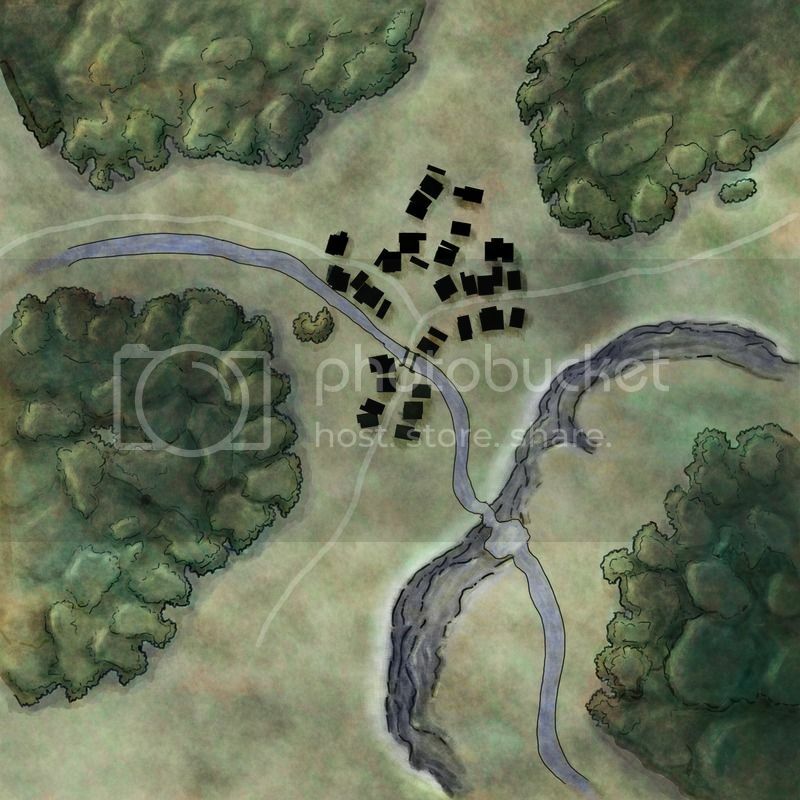 If it’s a battlemap – how would it play in a combat? If it’s a town map – are there sources of food, water, trade, and defence? These questions mean that the bones of the map make sense, and ensure the final map will hang together. It’s easier to change it now before we start adding detail. Once you have the general design in place – it’s time to lay in the detailed lines. Start by creating a new layer, and dropping the sketch layer back to 30% opacity (you can just see the sketch in the map below). If you’re using pencil, pen and paper, now is the time to move to pen. These lines will define the outlines of the major features of the map. Start by prioritising those elements that define the edge of a large feature – coastlines, the edge of a forest, a river, roads, cliffs. These are the most important details of the map – they are the information. Here I’ve used the style of line to sell the feature it represents. The edge of the forest is almost like the edge of a cauliflower, or a child’s drawing of a cloud. Lots of small curves joined together to make larger curved shapes. Don’t worry about making the edge completely contiguous – it can be messy. For the cliff, what you really see is all the edges, all the way down. Each edge is a ledge on the cliff, and because of the sharp drop, those lines are bunched close together. Where the lines are further apart, the eye naturally reads that as a smoother descent. So – we’ve illustrated our cliff, and conveyed useful information about the relevant steepness at different portions of the cliff. For more on how to draw cliffs in different styles, check out this tutorial. For the buildings, I’ve kept it really simple. Drawing building at a larger scale can take a while, and there are lots of tricks and tips for laying in large amounts of buildings quickly. In this I’ve used a simple collection of straight lines, elbows, and circles, to give some variety. I’ve placed some larger structures near the center, and followed the roads. There’s an unusually shaped structure off in the woods on the left (which will be a tower), and I’ve decided to place two flanking structures around the roads to the south-west and east. The town doesn’t have a wall, but it can have a couple of roadside lookout towers for defence. Note – at this time we have a serviceable map. Everything from this point on (barring the labeling) is to make it pretty. Outlines are only the start of the story – we need to add some detail. As before, create a new layer. We’re still using a 5px hard round brush with size set to pressure sensitivity. The detailed lines help sell the map. Some people make the mistake of skipping this stage. Detail here is actually pretty quick, and it makes life so much easier down the road. Lines are a very efficient way of conveying detail. For the forest I use short curved dashes. I follow the edges of the forest, except when the outline comes into the bulk of the forest. In those notches into the outline, I bring the details into the middle of the forest. This allows me to define the bulk forms of the forest within the outline. You can see the forms of clumps of trees that break up the mass of the forest. However, note that I don’t draw individual trees anywhere (except when there’s a couple of trees out there on their own). The cliff is already detailed, so I leave that alone. However I decided that the town needs a river. After all, people need to drink – and the cliff looks like it may have been carved by a river. So I add a new layer, draw a river outline, and move the relevant buildings out of the way. For the road, I keep the same brush, create a new layer, and set the blend mode to overlay (and the opacity to 30%). Then I draw in the smooth lines of the road. This keeps it separate from the lines, but very clear and easy to read. If you want a fancier version of roads with clean outlines, there’s a slightly longer method here. If you’re using pen and paper for this, now is the time to erase your pencil lines. 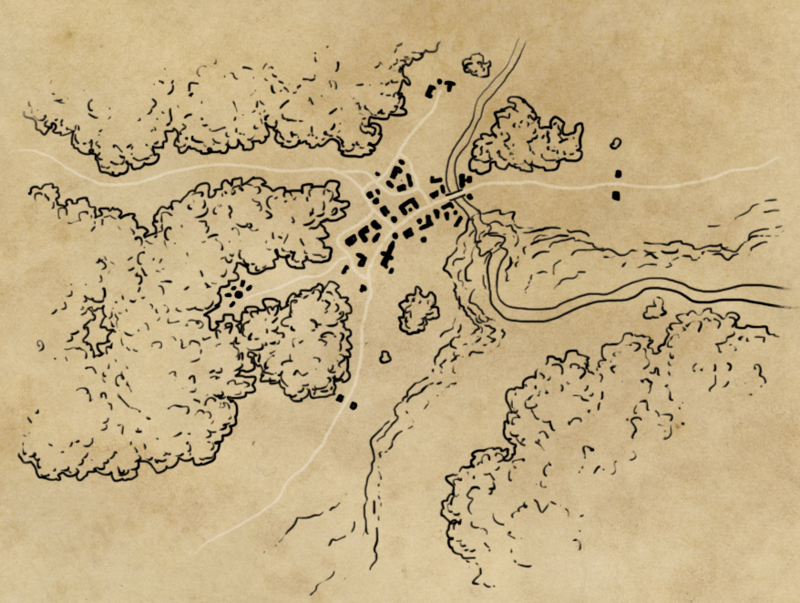 It’s actually pretty easy to turn your pen and ink map into an aged paper map like the one above (and the rest of this tutorial can be completed with a mouse). 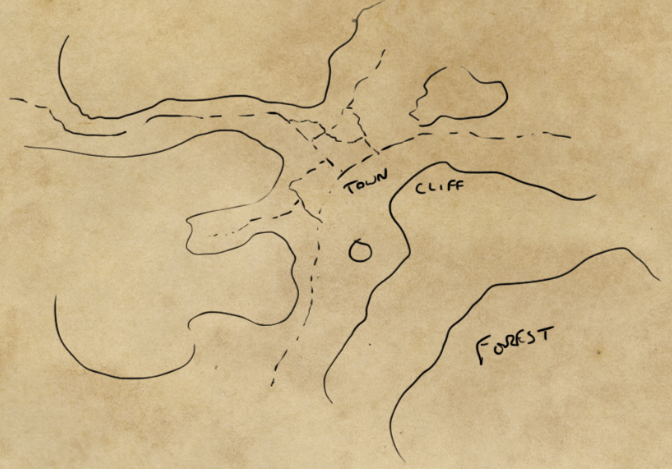 Here’s a run down on how to turn your paper map into digital line art. That’ll get you to the right place to take on the next steps. Not all elements of a map live in the same tonal range. By this I mean that the light parts of a tree are darker than the light parts on a patch of grass. The deep shadows of a forest are darker than the shadows on a road. So, to begin with, we block in the overall tone range of our map. Make the darker areas dark, and if there are particularly light areas, lighten them up. For this – create a new layer and set the blend mode to overlay. I then pick a hard round brush with size set to around 20-30px, and opacity set to pressure sensitive. This means that if I press lightly, I get an almost transparent line, if I press hard, I get a deep opaque black. Oh, and set the brush colour to black. I then work into the forest with an almost opaque black. Because the blend mode is overlay, all this does is create a darker tone of paper – and we keep those nice paper textures. Blend modes are super useful – if this if your first time hearing about them, read this quick run down of what blend modes are and how to use them. After blocking in the forest, I lay in some shadow under the bottom right edges of the forest. I’m going to work on the light and shade as if the light was coming from the top left of the screen so the forest would cast a shadow to the bottom right. The shadow isn’t as dark as the forest itself, but helps to give the forest some dimension. Forests aren’t just a single flat shade. So we need to give the map some body. This is where we’ll add that nice 3D feel to our map. Start off by adding another overlay layer. Pick a very light yellow for the highlight colour (almost white – something like #f8f8e6), and a deep blue for the shadows (something like #04050a). Now, let’s talk a little about brushes. Up until now we’ve used hard round brushes for this whole map. That still works for laying in the shadows on the river and the houses (note the hard clean edges on those shadows), but organic light and shade is rarely clean and hard edged (note the highlights on the forest). If you use hard brushes for everything you’ll get a map that looks plastic. Here I use hard round brushes (with pressure sensitive opacity) for the river and houses. For the rest of the shadows I use a grunge brush. There’s lots of them out there, but this particular brush is so useful that I created a tutorial for creating a grunge brush both in Photoshop and in Gimp. This is the brush that I use for the majority of the light and shade. Let’s start with the cliffs. I use a low opacity, medium sized brush (around 30-40px and around 20% opacity – remember with pressure sensitivity set to opacity as well). I slowly build up the shadows on the cliffs with multiple passes. Cliffs tend to be steepest at the top, so I work into the top edge carefully (decreasing the size of the brush so that I can get a sharp edge there). I lay in a light shadow across all of the ground below the cliff. This subtly pushes the lower ground into the background, and allows the reader to easily gauge that it’s lower than the land at the top. As the cliff tapers out at either end, the shadows are less intense – but every cliff edge has a shadow against it. Now for the trees. Here I use the mid sized grunge brush to deepen the shadows on the edges of the tree groups away from the light (so the bottom right edges). Remember those groups we defined inside the body of the forest? Now we are giving them form. After laying in the extra shadow, I switch to the highlight colour and sketch in some highlights on top of these groups of trees. This is not careful or precise. Forests are messy. But where there is a line, there should be a highlight or a shadow beside that line to show whether that side is higher or lower. Follow that and you won’t go too far wrong. As I mentioned, the river and houses get an easy quick shadow – the river is all darker, the houses throw a clean single cast shadow. Are we done? No! The grassland needs some light and shade too. Here I drop the opacity down to around 10%, and increase the size of the brush to 50-100px. I lay in a very light scattering of shadow on the grassland to give it some form. And equally a light pass with the highlight colour. It adds some subtle shape and detail to an otherwise uninteresting piece of land. So far so good – but all that brown is getting me down a bit. It’s time to add the colour and see where we’re at. When using colour layers I’ve found it’s best to start with a very low opacity brush (10% or less) and never use highly saturated colours. Otherwise you end up with neon lines across your map and it looks very bad very quickly. Clearly the main colour here is green. I start with the largest areas first. I pick a mid green for the foreground, and a different mid-green for the background colour. Then, I pick my grunge brush again, and in the brush settings I set colour jitter. This means that the colour will change as you draw. This is key – it’s never the case that you get one colour uniformly across a natural area. This means you don’t have to change colour hundreds of times, photoshop (or Gimp) will add the colour variation for you. Here’s the settings I use – note the two greens in the foreground/background colour picker. They are different I swear. The foreground green has more yellow in it. The 100% foreground background jitter means that the brush can be entirely the foreground colour, entirely the background colour, or anything in between. The saturation and brightness jitters allow the brush colour to vary away from the foreground and background colours. This gives a decent range of colours without going too far from your core colours. Now set the brush size to pretty large (50-100px+), low opacity, and block in colours across the map. On the first pass it will change a lot. Then build up slowly. Note, here I actually lay the green in uniformly across everything – trees, cliff, grass, houses, river. Once the base green is done, I move both my forground and background greens closer to blue, and slightly decrease the saturation, and add more colour to the forests. They should be a different green, and a little more saturated than the grassland. That’s coming along, but we still have green cliffs and a green river. For the cliffs, I use the eraser to remove some of the green. I use a hard round eraser with pressure sensitivity set to opacity. This means I can remove a little of the green, but not all of it. This keeps the map hanging together colour wise. Then I switch the foreground and background colours to greys and build up the grey along the cliff. Now I know that cliffs aren’t actually grey, but it’s a visual trope that’s easy to read. Finally, the river. I do this last because it’s the only feature with a hard edge. This means that by doing it last I don’t need to worry about mucking it up when working on the other elements. I pick a mid grey-blue and a hard edged brush. Then I lay in the colour carefully. Now our map looks a lot better. We could leave it at that. But I want to go a little more intense with my light and shade. This stage is very much up to your own taste. In this case I wanted some deeper shadows and some nice bright highlights. So I created two new layers – a normal layer (where what you draw is what you see) and another overlay layer. On the overlay layer I use my grunge brush with dark blue and do a pass over the whole map to darken the tone and deepen the shadows. On the normal layer, I take a very low opacity dark blue and lay in cast shadows along the edge of the forest and along the edge of the cliffs. This darkens the shadows, but also adds a colder colour. Finally, after deepening the shadows, I go back to the new overlay layer pick a nice bright highlight, and a small brush. I lay in bright highlights along the edge of the cliff, along the lightest edge of the forest, and along the edges of the waterfall. There’s a lot of white rushing water there, so we need some bright edges to show that. I also add some bright touches along the cliff lines to show where a ledge catches the sun. What we have so far is really a pretty picture – but it’s not really a map. You can’t use this to convey anything other than – there’s a cliff, some forest, and a town. 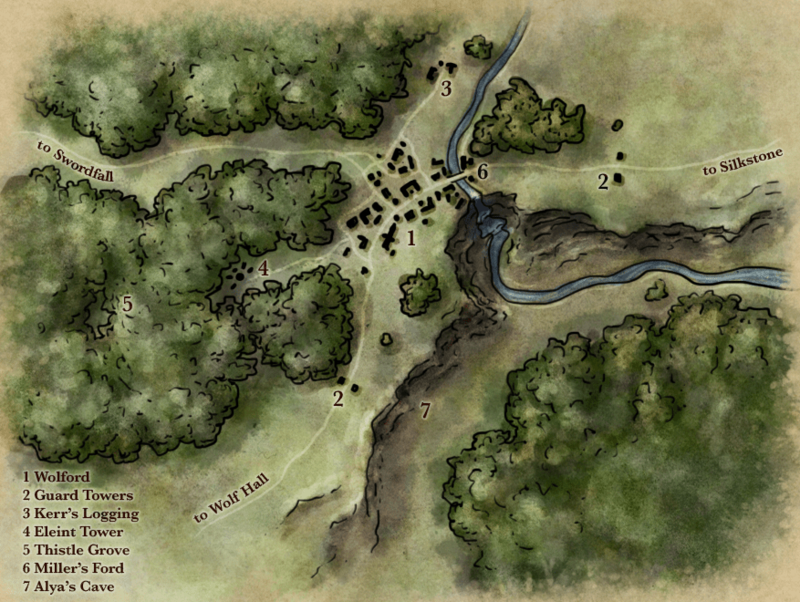 The next step is to add some text to the map to say what lies where. 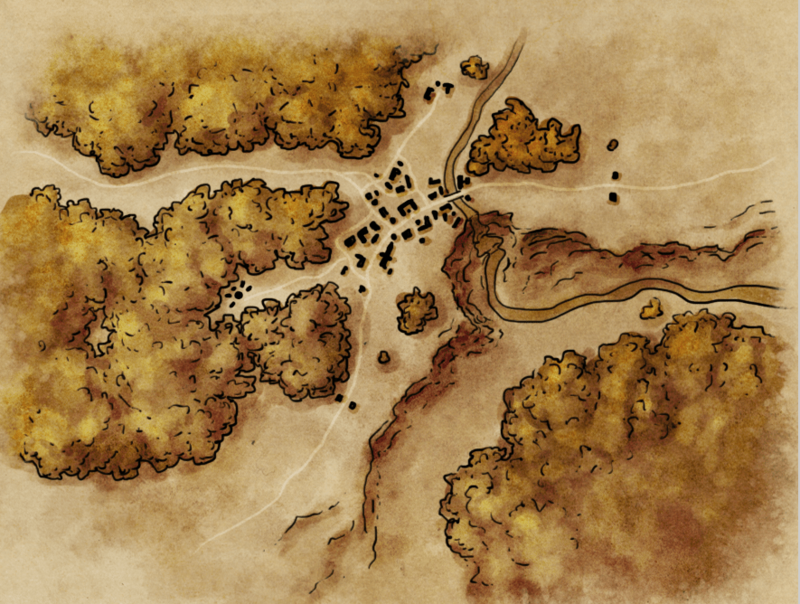 For a longer tutorial on this part of the process, here’s a full tutorial just on how to label a map. In this case I pick Baskerville – but any clean font works. I also pick a dark brown. Pure black text is a little jarring. I avoid heavily styled fonts for labeling – so no gothic fonts, no script fonts, and definitely no papyrus (unless you’re actually mapping a pyramid tomb). Use the font tool to lay in the numeric labels. When placing the labels try to avoid placing a label over a line. It’ll be super hard to read. Instead, offset the label from the feature it refers to in the nearest clear space. Once the numbers are placed, find an open section of map to place the legend. Here I have the top right and bottom left grassland to pick from. Lay a single text field and write out the legend. The legend font size should be smaller than the individual number labels. For the labels along the roads I use a nifty trick in Photoshop. Take the pen tool, click to lay an anchor point, then move along the line you’re following (in my case the road), click again and drag a little. You’ll see a line appear between the first and second anchors, and as you drag, the shape of that line morphs. Move a little further again, and click to end the line. This is a path. Switch to the type tool, and click at the beginning of the path You’ll notice that the cursor is actually on the path, and as you type the text follows the path. This is a great trick to get labels to flow along features. Once all the text is in place, select all the text layers, right-click, duplicate layers to get a second copy. Select all the copy layers, right-click ‘merge layers’ to get one layer with all the text as a single image. Now hide the text layers. That looks much better – we can now see our text labels, even in the darkest parts of the map. The last stage is to add any extra detailing you like. Here I decided to lay i a black outline to make it look like the map had a torn paper edge (you can check out the photoshop file to see how that was done), added a signature to the bottom right. With those final tweaks, the map is complete! Save the map out as a tiff, or as an uncompressed jpg. A quick note – it’s worth walking away from a map at this stage and coming back a day or so later. You’ll see things you want to change. I hope you found this useful. This is my core process for all maps. Dungeon maps, encounter maps, and regional/world maps all have their own tricks along the way, but the core workflow is the same. I’ll write up a few more posts on how to draw a map for those styles later. 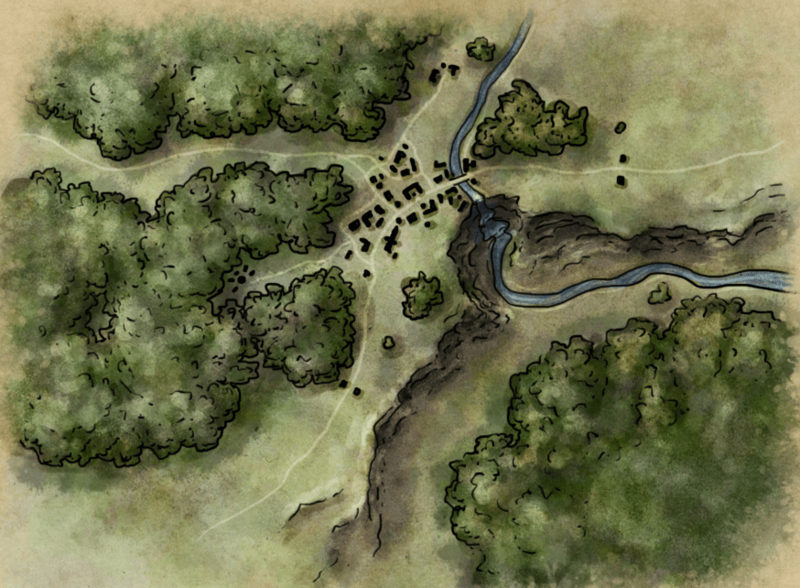 Feel free to tag me on Google+, Twitter, or Facebook with any maps you draw and I’ll drop over and check them out. If you have questions about this tutorial, throw them in the comments and I’ll answer them. I want to start drawing maps at the computer instead of using pen and paper. As a mouse is not the most suitable device I am looking for a pen or drawing tablet. Can you recommend something for a beginner? Absolutely! I’ve tried a bunch of tablets, and I always come back to Wacom. They’re a little more expensive than others but the quality is great. For starting out, I’d recommend a small Wacom Bamboo. There’s a few refurbished ones on there too. Equally, older tablets like the graphire are still good and you can often pick them up at a good price on eBay. I’d tend to stick with smaller tablets to start. Bigger tablets are more expensive, and require larger arm movements to use. I’ve not found them to be worth the extra size or expense. I moved up to a medium Intuous for my production mapping (including Game of Thrones) and that did the trick nicely – but that’s around $300 so only worth it if you know you’re going to be definitely doing a bunch of work with a Graphics Tablet. If you have the budget and plan to use it extensively, I’d go for the Intuos Pro (Starting at $250). I currently have the small version and it’s great, though with a big monitor I’d probably get a bigger one. A friend has the Pen & Touch ($100) and it’s also pretty good. If you’ll only use it occasionally that may be the way to go. I have an old graphire and it’s always been great. Problem is there don’t seem to be any drivers for recent versions of Windows. Without the drivers it has basic functionality but features like the pressure sensitivity and button customisation don’t work. So if you’re going to get a Wacom tablet I’d recommend a more recent one to make sure you get the most out of it. 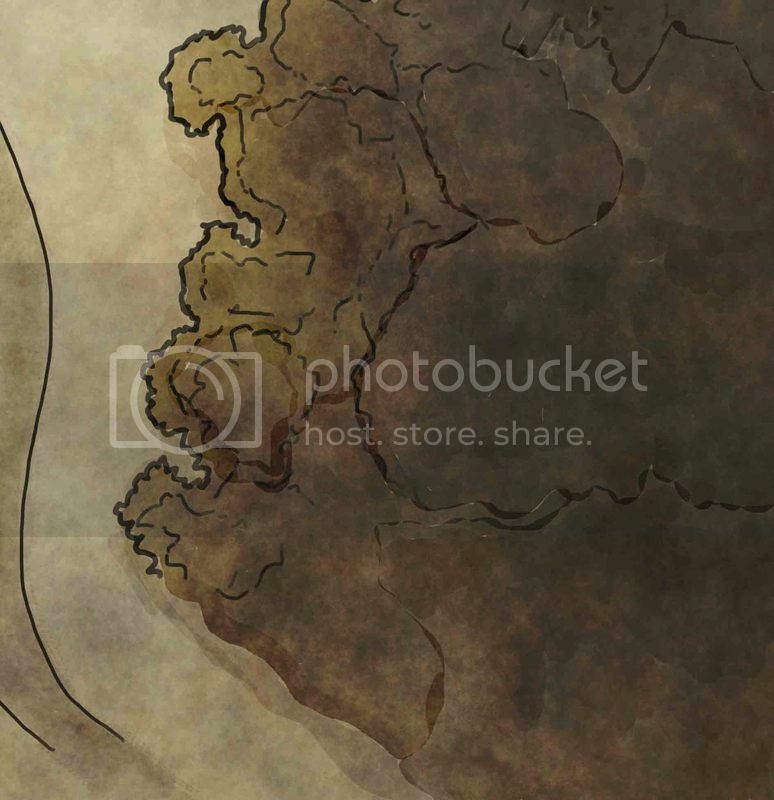 Hey, I`m currently writing a book where the world is divided in basically three parts, it has more lands on the north and south, and only a few in the Ecuator area. Kinda Fairly distributed. How much would you charge to draw a sketch for me? I dont need it way to detailed, just like a Global map. I’m afraid I’m slammed (as the lateness of this reply clearly shows). I’d recommend the Mapmakers Request forum at the Cartographers Guild. There are a lot of great artists on there. They’ll definitely do a good job for you. Can we translate your tutorial into Russian for http://rpg-news.ru? Please do – with all appropriate credit and existing links. Send me a note when it’s done? I’ve loved maps (specially ancient maps) since I was a child and now I’m staring to draw some for fun and for my campaign world (which hopefully will get a website sometime in the future). Since I found out about your blog it has become one of my favourite places on the Internet. Very interesting. Thank you for the article. Thank you for next great tutorial. By now i have tried drawing everything using pen and paper then scan it. But still i have difficulties to get nice outline like yours. its also hard sometimes to shade nicely with mouse, so i thinking about buying tablet. I know you recommend Wacom Bamboo or Intuos. I have been thinking about Intuos Pen Small Tablet. It is diffeent then yours, but i wanted to ask you do you have any idea is is a good to buy it, or better go for Bamboo ? They’re close, but I’d go with the Intuous if you can. I use an intuous pro for all my work, which is higher spec, but the whole line is good. Great tutorial as always Jon! Thanks for sharing. Man, I think this is your best one up until now. And this says much because all your tutorials are great! Awesome work, this will help so much. Glad to hear it! Good luck with your mapping. Yea I forgot to thank you profusely for this site and the tutorial it’s awesome! Thanks a lot! Looks great! You’ve got the core techniques down. The one thing I’d highlight is the river – at the moment it’s a single tone, with no light or shadow as it goes over the cliff. A touch of white to show the froth of the waterfall, and then some shade to show where it drops, will definitely help blend it in with the rest of the map. Fantastic tutorial and a beautiful map as always. You have such a charming style which makes you one of my favourite cartographers. I’ll promote this to the WBSchool followers. P.S. The header image looks great. I’ve heard of you in one of the fantasy blog i usually surf and i have fallen in love with your art. I’m trying too obviously, and i’d like to create a new and articulated world. I have to say i have not a wacom or other tablet to use, and i’m really upset, so i would like to know how did your adventure started? I’ve already realized a map following your tutorials, is really cheap and lacking in details, however, seen that is mouse made and it’s even my first one, i have been close enough. I would like to hear an answer from you just to know if i should give up or not, and if possible how to send you my map for tips if you can. You should certainly not give up! I’d suggest that you start with hand drawing with pen and pencil. No need for a tablet for that. Once you have that, you can pick up a cheap second hand wacom tablet. But make sure that you’re happy hand drawing maps first with traditional media. Brand new to map making. All I’ve done over the years is doodle, really, but now I’m working on getting more serious about it. 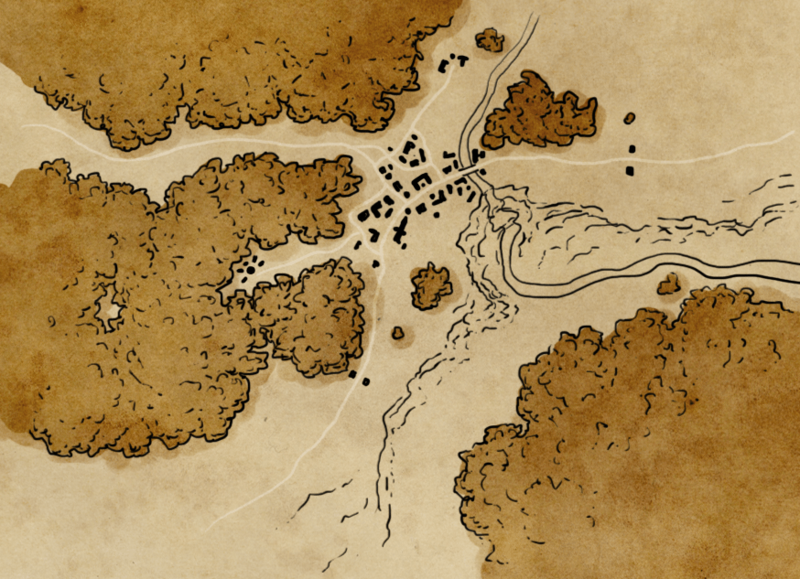 I mostly just make maps for my tabletop gaming group, which can sometimes require making a map on the fly. Your tutorials help out more than you can think and I just wanted to say thank you. Keep the great work coming! I was thinking… how large should the canvas be when we start on the map? Though there is the fact that on Photoshop or GIMP, the canvas can be enlarged. For me, I tend to start around 3000 pixels by 3000 pixels at 300dpi. That gives a decent starting area. But as you say – you can easily extend. Just finished this tut with a tablet. That’s still pretty damn good you know. Looks kind of like what Jon did. I had to compare the two to see the difference. But then again, to inexperienced me, most maps look the same. Thank you. I have yet to learn a lot. Have difficlut time with making better woods, also shading is very hard. Glad you like it though. Great job! This is looking really good. You’ve definitely got the core techniques down, the rest just comes with practice (sorry to say). It actually gets a lot easier pretty quickly. Thank you. I will continue to practice and looking forward for your next tutorials. 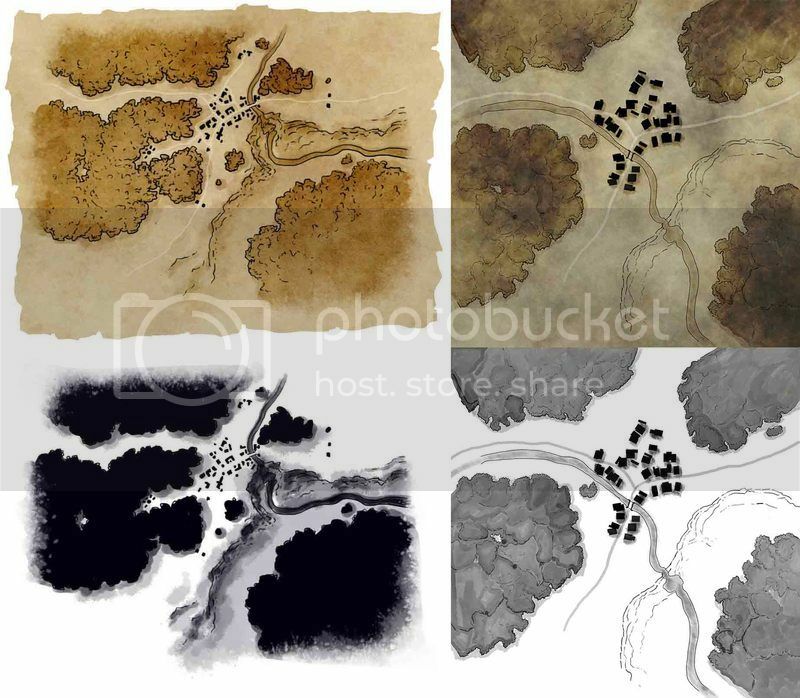 For couple of days i am trying to draw a regional map simillar to one of your older free map Dresdon Surrounds I see that you dont have many maps (at least uploaded) in this technique. I like it very much, but it seems you did those kinds of regional maps somehow differently i guess. I can do lines fairly ok, but then comes hard part with shadows. I do over and over again but my result is always simillar to yours “how to draw mountains top down tutorial” In Dresdon Surrounds mountains and woods seems less complex, but still can not figure it out (the shadows and colors). Any chance you would give a tip about that ? 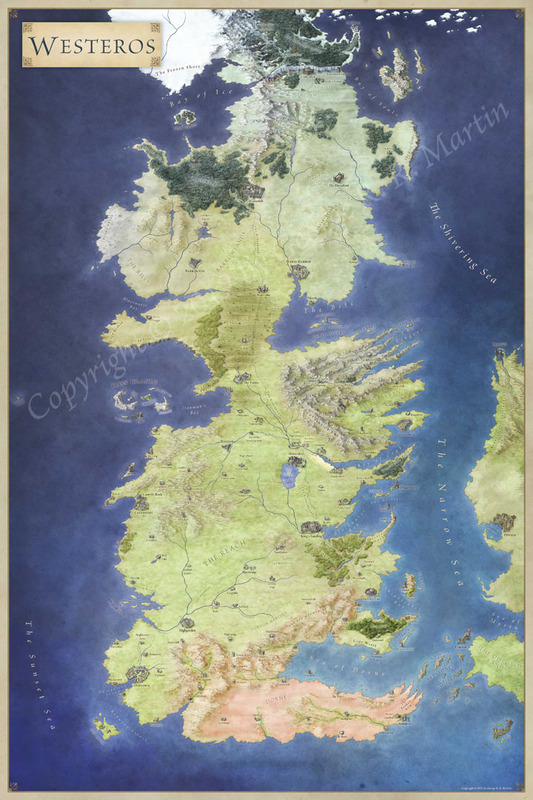 Also, there was other nice tutorial you have uploaded about your workflow over a piece of Game of Thrones map? Can not find it now, did you remove it ? 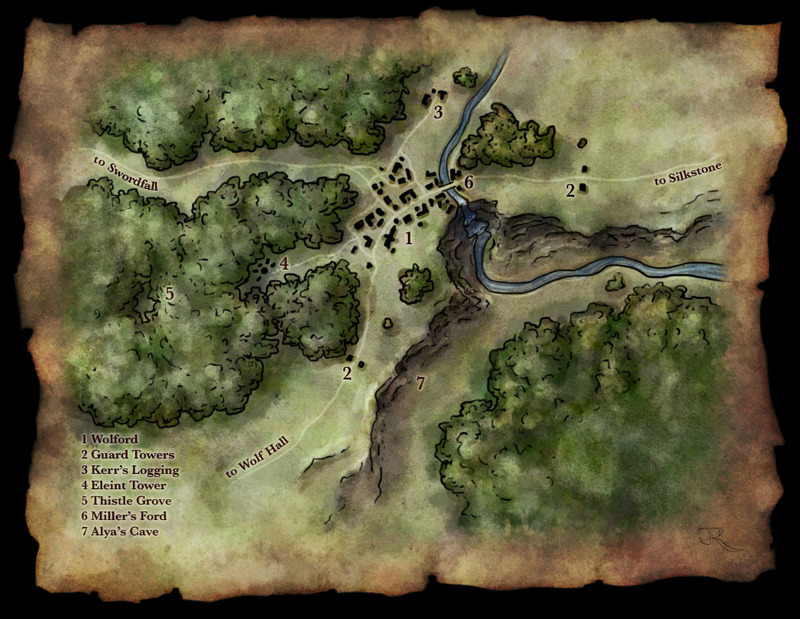 Oops!, it was not a Game of Thrones map tutorial, but a piece of World of Rhune map i guess. Great tutorial! Respectively there are others out there that are pretty good, but yours goes that extra mile. I use Pixelmator which still gets the job done, but sometimes I may forward the tutorial to Pixelmator support for I’m still learning how to maneuver through the program like a pro. Originally it started off with me researching and designing a Board Game (which I still am) but out of nowhere I’ve now become interested in mapmaking. It’s not that hard actually. You just take it slowly and you’ll get a good map at the end of the day. The workaround is to use Drop Shadow, since this can be manipulated into producing the same effect most of the time, and appears to be more memory efficient. Interesting. That’s a great warning. I suspect the code might be different in PS as I’ve never run into that issue. But drop shadow can definitely mimic this perfectly. The paper may well be the cause. You can get around this by reducing the saturation of the colour layer. To do this, when colouring, rather than using 100% saturated colours, pick colours that are closer to grey. 50-60% saturation is a good place to start. You can also reduce the opacity of your colour layer to get a ore subtle colouring. That’s a quick way to get closer. Thank you for making the psd. file available for download! Digging around there has already given me more insight than any written words ever could. Superb tutorial, thank you so much! I’m a writer for fun and lean heavily towards the fantasy/medieval genre. I feel that if you’re going to go in, you go in all the way, and I like to make maps of my little worlds. I googled ‘how to draw cliffs on a map’ and came to this website. I would be doing maps by hand and using water color colored pencils, and even so, this gives a ton of tips that I will definitely use. Thanks for the extensive tutorials! They are great! Can this map-making technique be done on a tablet computer, like a Microsoft Surface? Thanks, Jon, for such a clear tutorial and thoughtful answers to reader questions. Yes! I’ve run through this in procreate on the iPad. And I know it can be done in photoshop on he Surface. Good luck! I have i question about texture. If you have a free moment, can you tell me what do you do when a texture is too small for the canvas? I have hard time finding something larger than 2000px x 2000px If i have canvas 3000px x 3000px, streching it makes it look bad. How do you overcome this problem? Of course i am talking about seamless textures. Just found about this site, and I’m loving the tutorials, but I’ve been wondering how you’d go about creating dungeon maps with a grid on them. Do you add a light grid overlay in stage 1, or do you add it as an additional layer? I was thinking an adjustment layer set to overlay with the grid in it work, but I’m curious to see how you’d go about doing it. Thanks! Fantastic tutorial! I’m a long-time Photoshop artist but brand new to making my own maps for my games. I love the maps that come with the modules and have been wanting to create some of my own. With such a detailed walk-through, I feel like I know what to do now. Thank you! Great! Glad it was handy. What apps would I need to get started if I don’t have a wacom bamboo tablet and just a galaxy tablet instead? I’m not familiar with the Galaxy tablet – got a link? Can anyone give me some tips to fix the light, shade and colors? They look pretty good to me actually. I it just that they’re a bit intense? If so – you can just decrease the opacity of your overlay layer or the colour layers. Play with those two opacity settings and I’m sure you’ll get to a result you like. Dear Jon, first of all I would like to thank you for the really incredible map tutorials that you have in your blog. They are really inspiring and since I started to experimented with them i get more and more excited! I followed your tutorial and make my first map (actually i tried to recreate yours. I have to say this my first time that i use tablet with photoshop. Ηere is my first attempt: http://img.photobucket.com/albums/v304/gweinel/1st%20test.jpg I would appreciated if you have any comment to make. My second question has to do probably with my inexperience to use tablet. Here is a part of forest after the 1st overlay http://img.photobucket.com/albums/v304/gweinel/1st%20testcropped.jpg . Do you have any idea what i am doing wrong and have these overlaps on my shadows. do i have to reduce flow? something with the opacity? something else? In any way, thank you again for your inspiring maps and tutorials. Very interesting tutorial for a digital art/art niche. Seems like every second guide for fantasy art tutorials are about faces, bodies, creatures, or some random cliche still life. People often skip this kind of thing. Personally I hope it stays that way, as map artists deserve to be specialists (again, look at how saturated the character design field is). I do! Send me a note at jonathan@fantasticmaps.com and I’ll put you in touch with a couple of great artists who can likely help. Thanks, Jon! I have sent you an email separately.